For more than five years Elizabeth Hoak Doering has been mixing drawing and installation. 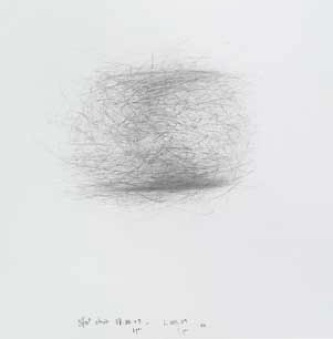 She has “objects drawn”, and natural elements, and thus explores the idea of an innerness in the non-human world, which is revealed in these graphic works. To produce things, witnesses!, already exhibited in Cyprus in 2009, she borrowed ordinary everyday objects (furniture, tables, chairs, cupboards etc) from people residing in both parts of divided Cyprus. She chose items of furniture old enough to have lived through the period when the island became divided. These objects are witnesses to history. For the exhibition Suspended Spaces#1, Elizabeth Hoak Doering is exhibiting five chairs of different weights, and made of different materials: office chair, drawing room chair, kitchen chair. Each one is suspended by a thin steel cable from the small ceiling beams, and fitted with a stylet which extends it until it touches the floor. 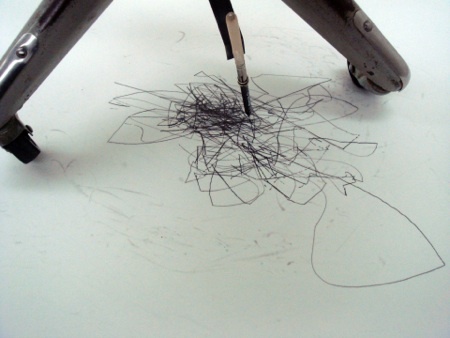 The traces left by the stylet’s movement are recorded on a sheet of paper laid on the floor. Each of her chairs is connected to a movement sensor placed in the exhibition venue; visitors’ movements activate the device which consists of small motors, wires and pulleys, giving a slight impulse to each chair, which then starts to oscillate like a pendulum. The stylet attached to the chair inscribes on the sheet of paper the marks made by the swinging chair. When the drawing made by the chair seems quite dense, this sheet of paper is replaced by a blank sheet. 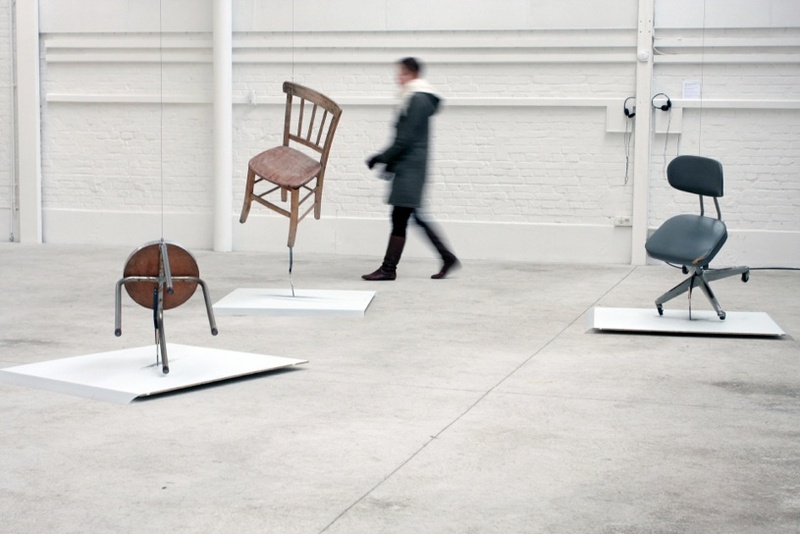 In addition, the recording of the narrative that the owners have made of their chairs, transmitted in English by the artist’s voice, is broadcast through headphones in the exhibition venue. Elizabeth Hoak Doering’s objects are sensitive to human presence: it is this latter which drives the natural oscillating motion of an object in mid-air. It is also to explore this link between people and objects that the age of the objects mattered to the artist: she wanted them to have an affective charge in the eyes of their owners. Familiar objects are taken as witnesses of the intermingling of two poles of identity—the political and the personal. They include their testimony through their physical data: structure, weight, centre of gravity. Because each drawing made is unique, one-off, the installation highlights the plurality of the expressions and experiences of a common history, that of Cyprus, underpinned by political conflicts. From a formal viewpoint, the drawings made by the chairs are at once chaotic and determined by a set of very precise, unpredictable physical factors, like the metaphor of patterns of social behaviour determined by the environment and incarnated in a particular individual form of conduct. Elizabeth Hoak Doering explains that since the 2000s she has been interested in the idea that artistic work is “already there”, present in the outside world, and that the artist’s work consists in noticing it and rendering it material in imagery—in other words, “translating” it.